Sultan Mahmud I. Emperor of the Ottoman Empire. Home » Sultan Mahmud I. Emperor of the Ottoman Empire. 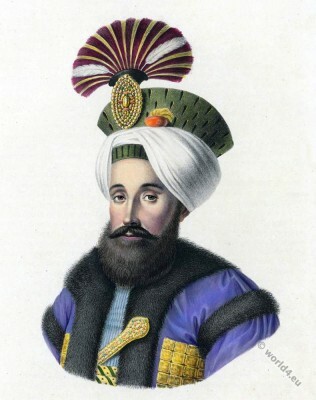 Sultan Mahmud I (1696-1754) was from 1730 to 1754 Sultan of the Ottoman Empire. Mahmud was the son of Mustafa II. and was during the Patrona Halil Rebellion-instead of his uncle Ahmed III. placed on the throne. 1754 died Mahmud of heart disease, when he returned from Friday prayer in the mosque. During the reign of Mahmud, the system was introduced, to send Phanariots as an administrator in the principalities of Moldavia and Wallachia. The Costume of Turkey. Ottoman Empire during the 18th century. Asian costumes by Auguste Wahlen. This entry was posted in 18th Century, Nobility, Ottoman Empire, Turkey Costumes and tagged Ottoman Empire costumes on 5/4/15 by world4.